Don’t miss this live event 7:30pm-8:30pm BST, 2:30-3:30 EST, 11:30-12:30 PST. FIVE of West Midlands Police’s most dynamic departments will come together during a live online ‘hangout’ in a UK policing first that promises to give viewers a real-time insight into the work of critical force units. 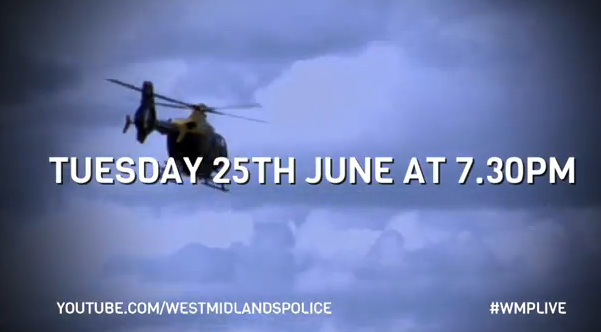 ‘WMP Live’ sees officers from traffic, motorway policing, dogs, firearms and air operations hook-up simultaneously through a live internet streaming event on Tuesday (June 25) from 7:30pm-8:30pm BST, 2:30-3:30 EST, 11:30-12:30 PST. Using smart-phones or tablets they’ll be filmed on duty and use the opportunity to discuss their roles, equipment at their disposal and field questions from people who join the hangout on the force’s YouTube channel (www.youtube.com/westmidlandspolice). Twitter users can post their questions in advance, and during the event, using the hashtag #WMPLive. West Midlands Police Operations Chief Inspector Kerry Blakeman, said: “We’re always keen to explore latest technology that affords new ways of reaching out to people across the West Midlands. This promises to be an exciting insight into the work of units that largely go unseen by the public. “Officers will be filmed whilst on duty so there’s always the potential for viewers to see units being dispatched live to incidents as they happen. • Sergeant Dean Caswell talking live during a motorway police tour. • And Chief Superintendent Chris McKeogh who’ll give an overview of West Midlands Police’s Operations department.